Total Miles Walked = 1263.8 Only 914.50 Miles To Go! Well it's just 5 days before I start my walk and I've hurt my right knee. I don't think I did it on my last training walk. It felt fine after my walk last Sunday afternoon, and it felt fine Monday night when I went to bed. But earlier on Monday afternoon I played hide-and-go-seek with two of my grandsons and two of their friends. I think I must have made a lateral, out-of-axis, movement with my knee that caused it to start hurting. Whatever I did I woke up during the night with a sore knee. It was still sore this morning at 5:30am when I started what was to be my second to last training walk with a 31 pound pack weight. I walked about 300 yards and turned around and came back. Nothing to be gained in doing that. Stop and let it heal. The good news is I have had this before and it's gone away, so hopefully, God willing, and with no more training until lift off day it will be fine. If I had completed the last two training days I would have walked 535.6 miles since January 2, 2007. Most of this was on the 11.6 mile Canal Loop Trail at the north end of Land Between the Lakes National Recreation Area. My pack weight went from 11 pounds to 31 pounds. As it is now I have walked 512.4 miles. That's enough. Physically I am ready. I will keep you posted on the knee. There are 4 days to go and I am ready to get started on this walk. Planning and training are in the past and now I'm stir crazy. Today I attended the board of directors meeting of a public housing board I have served on for over 30 years. It felt weird, bidding my fellow board members farewell to start a 2200 mile lark. My son, Glen, suggested that I purchase a wireless device to post journal entries. I tried one for a week, a Motorola Q, liked it ok, but today I traded it in on a better one. This copy is being produced on a Palm Treo 700W I am using the touch screen keypad to type this. I can cut and paste and it has spell check too. I can't find a thesaurus though, so vocabulary will be limited to whatever words I can come up with out of my head. This device weighs 6 1/8 ounces, battery included. The AC charger and its cord weigh another 3 1/2 ounces, but I can cut and splice the cord to save weight. This is quite a bit of weight but the camera and batteries I had planned to carry weighed 5 5/8 ounces, so the net increase is not that bad and this device has a 1.3 megapixel camera too. Glen said it not have a shutter delay so I'll have to deal with that, which probably means I won't be sending many photos with me in them except for the occasional arm's length variety. But that's no big loss. Well I need to see if I can get this thing to send and receive and then practice on it some more tonight to see what else it will do. Yesterday afternoon I visited and played with 4 of my 12 grandchildren, Lily, Max, Hope and Jack. Ten more live here in Paducah, and I have two, Jackson and Ben in Orlando. 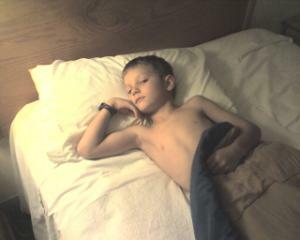 Then last night 2 of my grandsons from another family, Elijah and Wil, spent the night with me. At bedtime we read 2 chapters from THE LAST BATTLE by C. S. Lewis and this morning we read 2 more chapters. Now we are going to Burger King for breakfast. Wil says he likes those cini-minis. As we ate breakfast and the boys played in the indoor playground I was struck once again with a lonely feeling. I thought about being separated from my family. I know it's going to be difficult; some say the first 3 weeks are the worst. In any case, we shall soon see. All my business is taken care of and my gear with the exception of a waterproof stow bag for this little typewriter has been in order for several weeks. My only real concern at this point is my ability to operate this thing on the trail. But if it won't work or it gets wet I'll revert back to pencil and paper. By the way, my right knee is fine, probably just a case of last minute negative jitters. Now I'm starting to think I may have stopped training too soon and that I will not be fit enough to start walking next Monday. Get thee behind me Satan! I awoke this morning on my pallet beside my bed at 4:15am. Actually it's not a pallet. I have been sleeping on the floor for over three years now in preparation for this AT walk. In doing so have grown to like the floor better than the bed. The floor, like the ground , provides a more restful night's sleep and treats my back better than my bed. Try it. I awoke with renewed confidence. Somehow, as I lay there on the carpet thinking about all that lay ahead, I knew, I just knew all was well. Excitement and confidence had replaced nervousness. I even knew I would master the quwerky (or is it QWERTY) Palm Treo 700W device. And master it I have as you will soon see. At least the part about getting this to you in a WORD document with a photo attached at low resolution to save battery power. Keep reading and judge for yourself. I spent the next 2 1/2 hours typing in WORD, sending to draft, taking pictures, moving them to somewhere, retrieving, going to file, touching Send with the stylus (I like that word, stylus, and I wonder about its derivation. Do you? ), and following many other steps to numerous to recount. The result is that I can now bold, italicize, underline, or any combination of the three. I can also cut, copy and paste. You know what I think now? I really believe this little bugger es mejor than my desktop at the office. Es mejor means "is better" in Español, and I used it here to show you I can even make the little enyay squiggle over the n in Español. After mastering Mr. Palm Treo I downed a quick Mcgriddle and coffee and picked up my son, Gil. We drove to Marina Village, a real estate development that I manage in Grand Rivers, KY. We looked after things in the subdivision and then attended a meeting with my business partners (two of the finest friends a man could have) and some engineers and real estate folks. The meeting was exciting. We have big plans and there is a lot to think about and do. After the meeting and after a good country dinner at the Iron Kettle it dawned on me, "This is your last trip to Grand Rivers for a while you old rascal." And it was and it felt funny and made me sad and apprehensive for about 5 minutes. Well, my word count, which I can check by the way, is already too high and many of probably see nothing here that has anything to do with a walk in the woods, so I'll attach a photo, in low resolution to save battery power of course, and sign off for now. 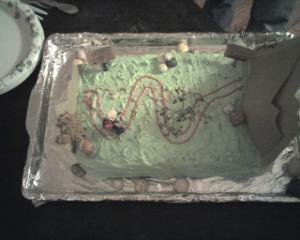 Last night my family had a going away party for me. There was a printed show bill. The program included a lightweight guitar solo - one cord, a petite pet - an ant in an envelope, a small Scripture reading - Jesus wept, and a miniscule minuet - about 3 notes. There was a reading of The Road Less Travelled by Robert Frost and an itty bitty interview conducted by my grandchildren. They asked questions about my walk, and, as it turned out the interview lasted long that it was not really lightweight, more like midweight. They had a lot of questions. But they saved the best for last. They prayed for me, for my health and stamina. 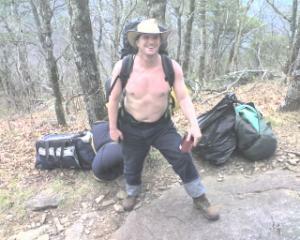 And they prayed that this walk will honor the Lord and that others as well as me will be blessed by my walking the AT. To that I offered a hearty amen along with a silent prayer of my own. I guess I am really going to do this thing. We leave for the AT's Southern Terminus at Springer Mountain, Georgia tomorrow. Today, as Glen and I (Glen mostly) loaded the address book from my PC into this little jewel, it dawned on me, "You are sitting at this desk for the last time for 4 months or so." Then I stopped by my regular grocery to pick up some fresh fruit for the first 3 days on the trail and it hit me again, This is last time I'll shop here for awhile.	" Just looking at folks in the check out line gave me pause. I thought, "They are going to leave here and drive home to a warm, dry house (a cold rain is falling outside) and I've got two more days that I may say that about myself." In any case we leave tomorrow. There is no backing out now. This morning I threw my loaded backpack with all my gear and three days of food in the back of my van. Without any water it weighs about 16 1/2 pounds. I tossed another lightweight wind shirt and an extra pair of long underwear in my overnight bag just in case. I'll make a decision on whether to pack them in the morning. I cleaned the house, turned off the water heater and loaded up the remaining perishables to take to my kids. Then we went to church and I was prayed for again. These prayers mean a lot to me. Thank all of you that have prayed and that are praying. My son, Gil, and my grandsons, Elijah and Wil, left for Georgia at 2:45pm. We arrived the Amicalola State Park Lodge at 11:00pm Eastern time. There were trees down and limbs scattered over the approach road to the lodge. A cold wind was blowing. I told Gil that I was glad this was not my first night on the trail. As hard as it's blowing though it should pass through before morning. I 've got weather.com on this baby typewriter and it shows good weather ahead for the next week. That will be good. I need time to acclimate. God bless all of you back home and God bless all of my family. Today we awaked to a cold 40 degree wind and I had a case of the green apple quick step. These two combined prompted me to tell Gil and the boys that I was thinking about waiting a day to start walking. I talked about delaying all the way up to the access road parking lot. All four of us walked the .9 miles to the top of Springer. There was a skift of snow on the mountainside and patches of ice and thawed mud too. But even with the cold and 40 mph wind I was but still belly aching about my minor inconveniences. But when we returned to the parking lot (You retrace the .9 miles. )we met Javier. He's the guy in the photo with Gil with the gadgets hanging off his crutches. He said he has polio, not had - has. And why was he at Springer? 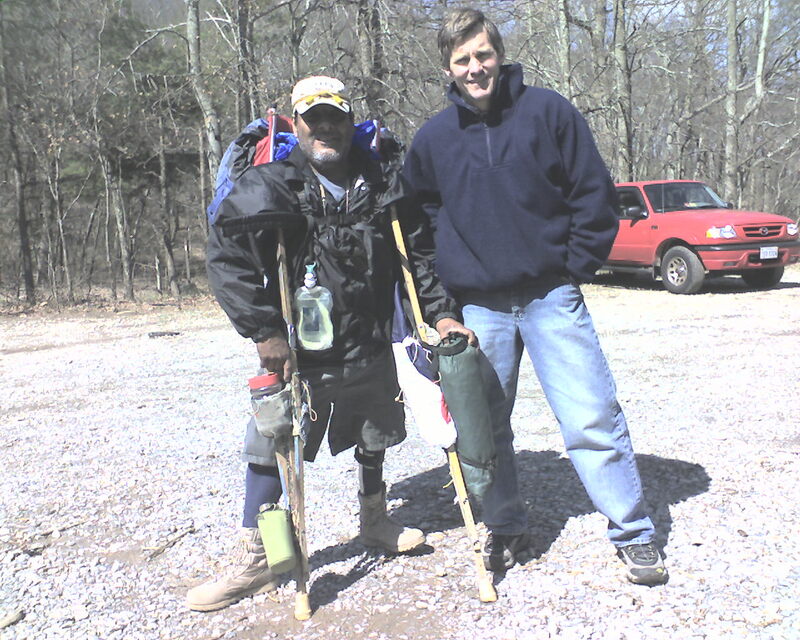 You guessed it, he plans to through hike the AT, all 2175 miles. Gil even helped him hide his backpack under a pile of leaves so he wouldn't have to carry it up to Springer. What an inspiration. I put on my pack and headed out, but not before some more prayers and a few tears. It was weird but not for long. Soon I was walking through literal tunnels of rhododendron and mountain laurel that were not yet in bloom. And yes, the north Georgia hills are steep and long. I walked too far today, 14.9 miles plus the extra .9 up to Springer. I am tired. Tomorrow I plan to slow down. Today I slowed down and tonight I feel much better. Twelve miles a day is my goal for awhile so today's mileage is right on target. I got my trail name today, Ringmaster, because of the ring trick I've been showing to everyone I meet. Some of you reading this have seen it too. It's magic and involves a small steel ring and a ceiling fan chain. The weather here is perfect for a walk in the woods. It was about 45 and clear last night and today was sunny and probably 65. Tonight is to be clear too. I went online to check. That's good because my tarp is in a bad place if it were to rain. I don't have a photo for today so I'll send one from yesterday morning at the top of Springer. You may be wondering what I'm eating. Today I had granola with raisins for breakfast. Lunch for me is sort of a mid-morning through afternoon affair. Today I munched on pre-cooked bacon, granola bars, cashew nuts, dried apricots, an orange and an apple. Supper was instant mashed potatoes with chicken noodle soup and bacon, all heated up and mixed together. A culinary delight. Got to go to bed now. It takes lots of rest to walk the AT. God bless you all. Here's the way I see this journal. With information on everything in the world available at the click of a mouse why report stuff that others have already done better than I can? For example, I walked over Blood Mountain this morning at 8:30am and it was exquisite. 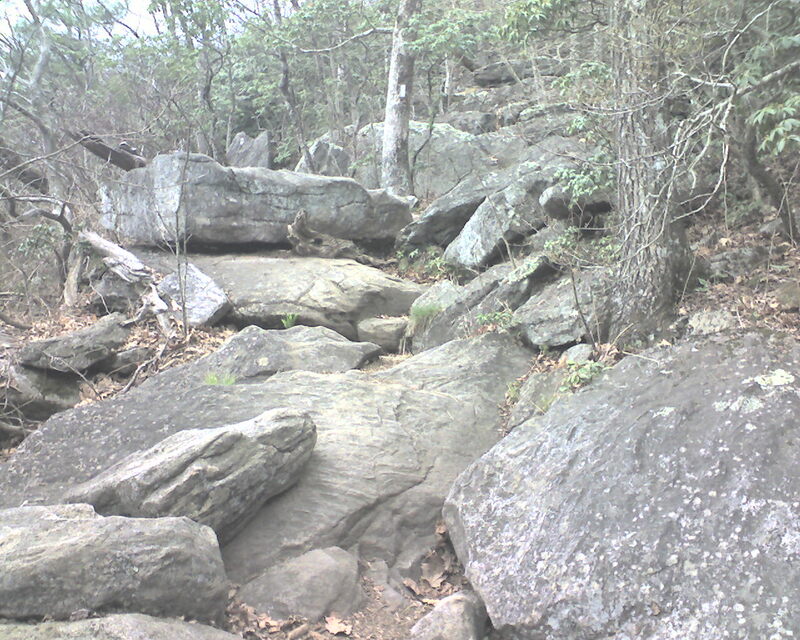 But, if you want to see a photo or read about Blood Mountain, GA, or see a picture of the Blood Mountain Shelter on the AT, all you need do is click the same mouse you've got in your hand right now and you will be swamped, both with information and photos. I want to record something different. And so it is with Trapper James, the guy in the photo. I encountered Trapper staggering up the north side of Levelland Mountain at 2:00pm today. As you can see he's loaded down with stuff. Trapper said his stuff weighed 400 pounds and included books on history and philosophy. He has a heavyweight backpack, two sleeping bags, a loaded soft suitcase, a crammed full duffel bag, and a plastic garbage bag full of Lord only knows what. Trapper is his his real name, not a trail name, and, if you can believe it, he named a son Jesse. He said he'd just gone through the big 'D' and he didn't mean Dallas, and that packing all this stuff up and down mountains beat drugs and alcohol. I thought he might be right about that, but seeing the shape he was in, I didn't agree or disagree. Trapper has a method for moving his stuff along the steep trail. He moves it piece at at time in 200 yard increments, retracing his steps 8 times to make the 4 round trips. Then he does it again. I prayed for his safety and health and asked if I could help him. He said he was fine and had plenty of food and water. As I walked ahead thinking of Trapper the word enigma kept popping into my mind, for Trapper certainly is one. I left camp at 7:30 this morning and arrived at Walasi Yi at 10:00am. My first drop box of food and supplies along with my bounce box had safely arrived. I washed and dried my clothes, showered and shaved, ate two monster hot dogs, drank a root beer and coke and had a big bag of M&Ms. All this took 3 hours because I wanted to make sure I had everything done right. If you forget something there's no Walgreen's at the next corner. Tonight's shelter is nice and it's 1.2 miles off the trail. There are four of us here tonight, a man and wife and Tim from Massachusetts, a through hiker I've camped with the past 3 nights that hasn't gotten his trail name yet. Last night as I was completing yesterday's journal entry I told you about a man and wife that joined Tim and me at Whitley Gap Shelter. Tim and I were already in bed when they arrived. (Bed is a wooden floor and whatever you have for a pad, which for me is a 3/8" foam pad.) I had just sent the journal entry when the fun began. The man (I didn't get his name) lit up a cigarette, the first of several, right in front of the open- fronted shelter. The smoke blew in on Tim and me. Next he set a wooden shelf on fire with his stove. When I told him I smelled smoke he said they should make the shelves out of something fireproof. Then he and the wife blew up two big 3" thick air mattresses. This took at least 20 minutes. Eventually they bedded down and within 20 more minutes they were snoring loudly, in unison. I left the shelter and set up my tarp a good 100 yards away where I enjoyed a restful night's sleep. Tim stuck it out all night. I left camp this morning at 7:14am with the smell of cigarette smoke in the air and walked the 1.2 miles back to the AT. On the way back I walked through one of the many tunnels of mountain laurel. I'm looking forward to seeing them in bloom. The day's walk included quite a bit of rock hopping as shown in the photo. 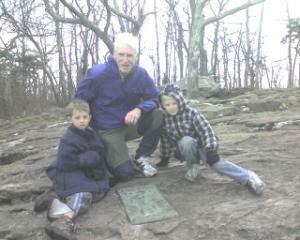 In it you can see the 2" by 6" white blaze AT trail marker on a tree in the background. These markers show the way from Georgia to Maine. I did 13.8 trail miles today and if you count the 1.2 up the hill out of Whitley Gap this morning I did a total of 15 miles, so, at this point I am pleased with that. I decided to come into town tonight and get some real food to supplement the drop box fare that I packed at home. I have enough now for five days on the trail. And, the steak dinner tonight was a welcome change. As usual, I've got to stop and get some sleep. God bless all of you.